Note: all screenshots and functions listed in this article are performed with a PC while using Google Chrome. 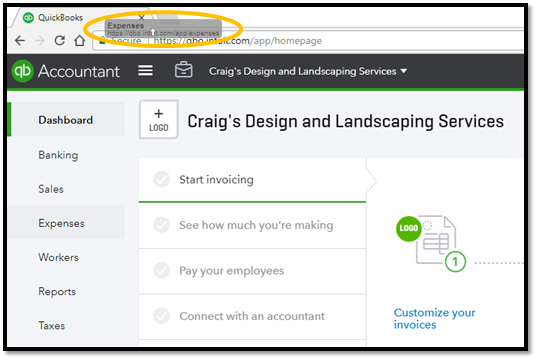 Intuit Recommends Google Chrome as the default web browser for QuickBooks Online. Other web browsers (Firefox, Internet Explorer, Safari, Opera) have similar capabilities, but may look different while performing the function. 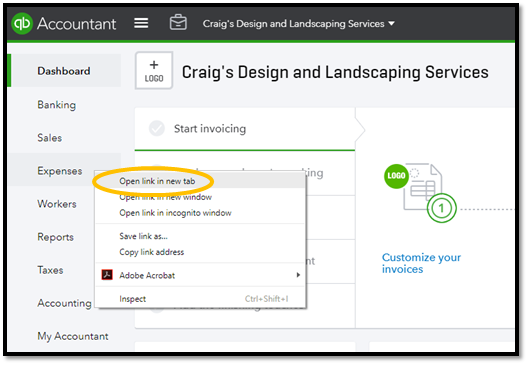 Find the QuickBooks Online feature you want to use in a new tab, right click it, and select Open link in new tab. Perform this function as many times as you want with the features you want to use. You can now navigate to another access point in QuickBooks Online in several simultaneously open tabs for the same company. 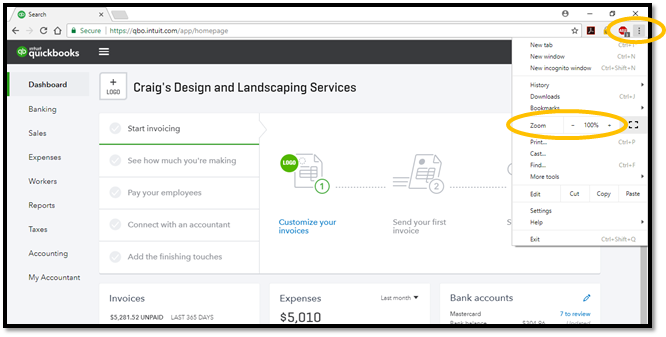 Another way to open a QuickBooks Online feature in another tab is to left click and hold the feature (Expenses shown below), then drag the feature you want to the Google Chrome tab area. Google Chrome will show a small white arrow in the tab area, showing you where it will drop the new tab. Release your mouse when you have moved the feature to the tab location of your preference. Users can work in QuickBooks Online while using multiple windows. This is beneficial because users can place an open window on each monitor. The windows are independent of each other, unlike working in tabs. 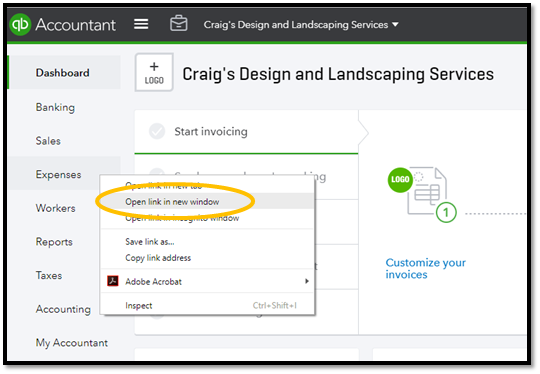 Find the QuickBooks Online feature you want to use in a new window, right click it, and select Open link in new window. If you already have the feature open in another tab, you can separate the tab into its own window. Separate any Google Chrome tab into its own window by left clicking and holding the tab, and pulling down until the tab appears in its own window. Drag the new window to another monitor and release the mouse.